Brief Description: The Razer Synapse software has a service (Razer Synapse Service) that runs as “NT AUTHORITY\SYSTEM” and loads multiple .NET assemblies from “C:\ProgramData\Razer\*”. The folder “C:\ProgramData\Razer\*” and recursive directories/files have weak permissions that grant any authenticated user FullControl over the contents. It is possible to circumvent signing checks and elevate to SYSTEM using assembly sideloading. When the Razer Synapse service starts, it will load .NET assemblies out of various directories within “C:\ProgramData\Razer\*”, such as “C:\ProgramData\Razer\Synapse3\Service\bin”. 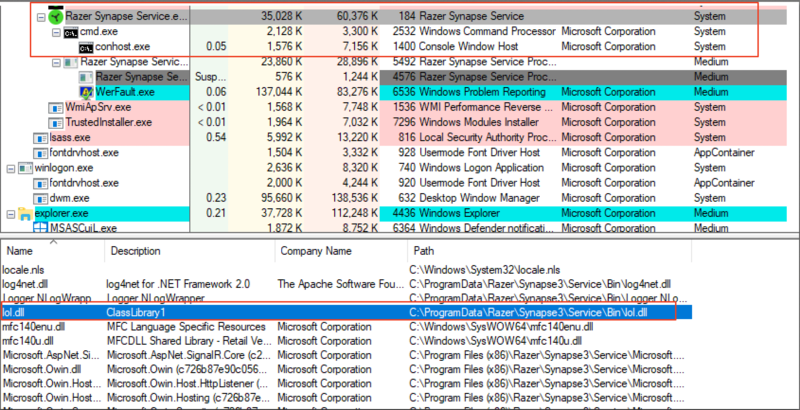 In theory, an attacker could simply replace an existing .NET assembly with a malicious one, reboot the system and let the Razer Synapse Service load it when it starts. This approach came with some complications, such as a race condition to replace an assembly before the service loads it. Additionally, the service implements some checks that must be passed before the assembly can be loaded. For efficient exploitation, it is important to fully understand the conditions in which an assembly can be loaded successfully. The first issue to tackle is getting a malicious assembly planted in such a way that the service will try to load it. Hijacking an existing assembly can be challenging as low privileged users do not have rights to stop or start the Razer Synapse service. This means that to trigger the assembly loading code path, the box needs to be rebooted. This makes winning the race condition for swapping out a legitimate assembly with a malicious one challenging. Looking at the service, this problem is solved pretty easily as it recursively enumerates all DLLs in “C:\ProgramData\Razer\*”. This means that we can simply drop an assembly in one of the folders (C:\ProgramData\Razer\Synapse3\Service\bin, for example) and it will be treated the same as an existing, valid assembly. After recursively enumerating all DLLs in “C:\ProgramData\Razer\*”, the service attempts to ensure those identified assemblies are signed by Razer. 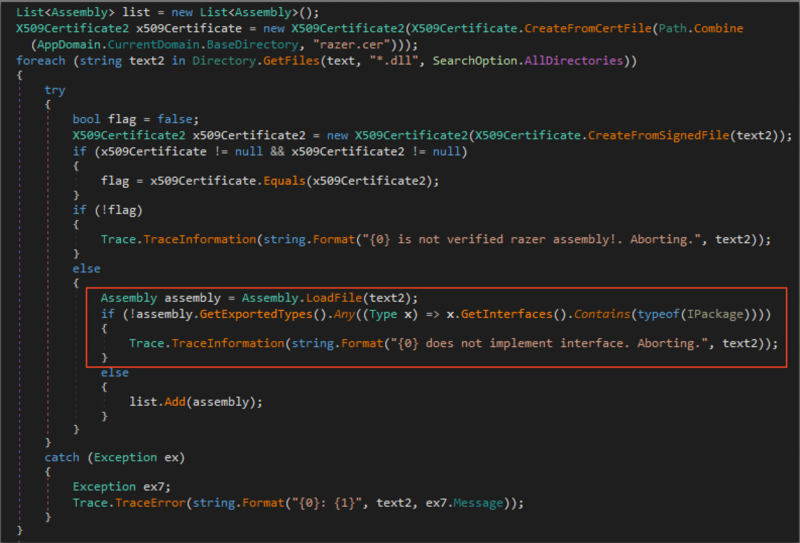 This is done by grabbing certificate information from “Razer.cer”, calling X509Certificate.CreateFromSignedFile() on each assembly and then comparing the certificate chain from Razer.cer with the assembly being loaded. If the certificate chain on the assembly doesn’t match that of Razer.cer, the service will not load it. 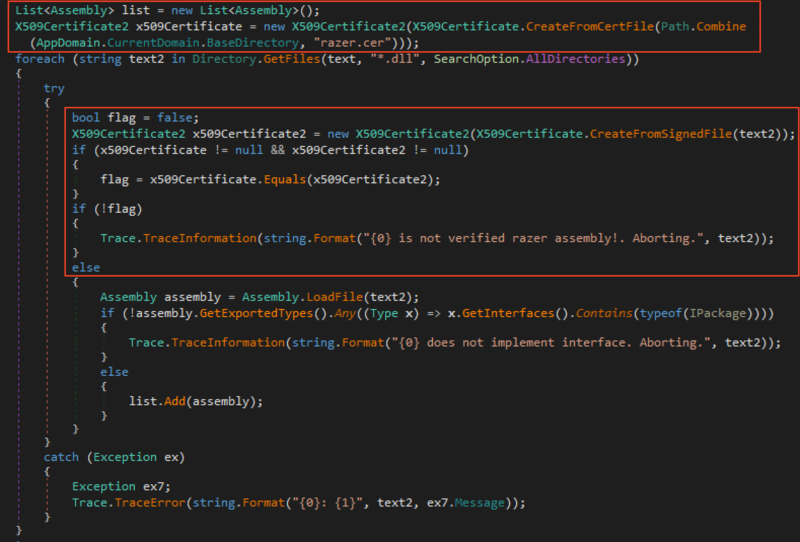 While the thought behind checking the trust of .NET assemblies before loading them is good, the implementation wasn’t robust, as X509Certificate.CreateFromSignedFile() only extracts the certificate chain and in no way attests the validity of the signature of the file being checked (https://twitter.com/tiraniddo/status/1072475737142239233). 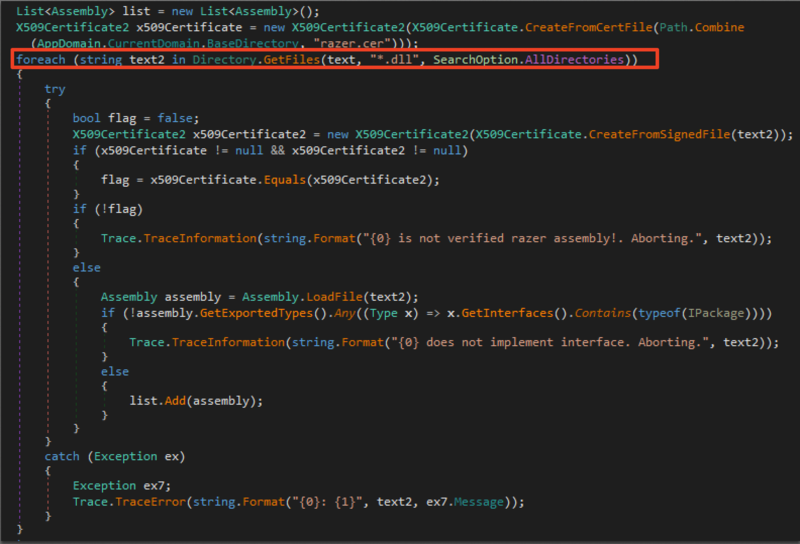 This means that it is possible to use a tool such as SigPirate to clone the certificate from a valid Razer assembly onto a malicious one, due to the fact that the signature of said assembly is never actually verified. Once the assembly passes the certificate check, the service will then load it into the current app domain via Assembly.LoadFile(). 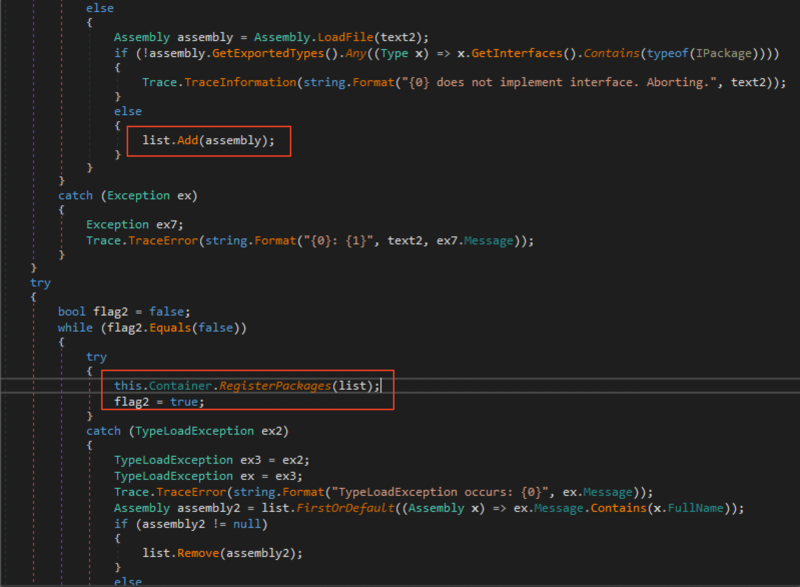 No malicious code will execute during the Assembly.LoadFile() call, however. After doing so, the service will check to make sure there is an IPackage interface implemented. 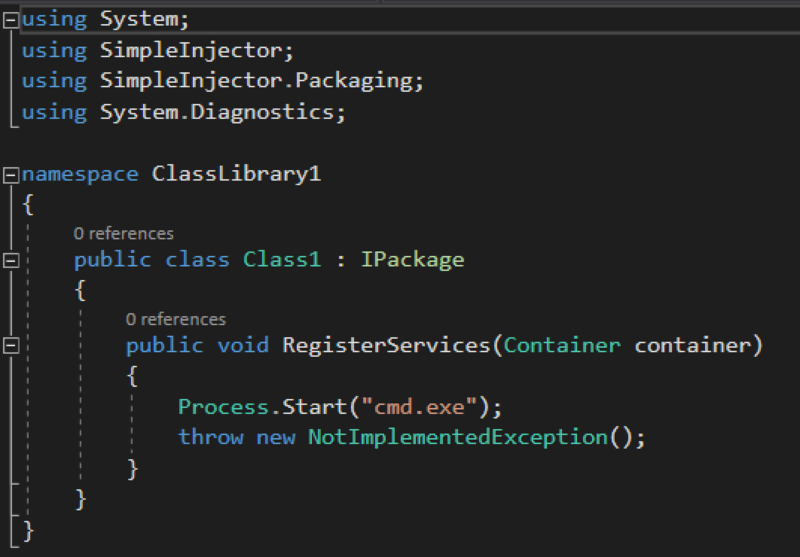 This interface is specific to the SimpleInjector project, which is well documented. The only requirement to pass this check is to implement the IPackage interface in our malicious assembly. Once the service validates the certificate chain of the assembly and verifies the presence of IPackage, it adds the assembly to a running list. Once this is done for all the assemblies found in “C:\ProgramData\Razer\*”, the list is then passed to SimpleInjector’s “RegisterPackages()” function. 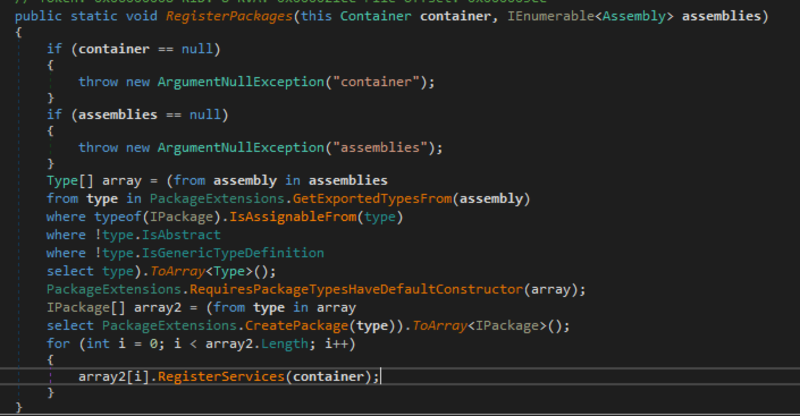 RegisterPackages() will take the list of “verified” assemblies and call the “RegisterServices()” function within the IPackage interface of each assembly. This is the point in which we, as an attacker, can execute malicious code. All that needs done is to add malicious logic in the “RegisterServices()” method within the IPackage interface of our malicious assembly. At this point, we have found ways to abuse all of the requirements to get elevated code-execution. At this point, we have a malicious assembly with a “backdoored” IPackage interface that has a cloned certificate chain from a valid Razer assembly. The last step is to drop “lol.dll” in “C:\ProgramData\Razer\Synapse3\Service\bin” and reboot the host. Once the host restarts, you will see that “Razer Synapse Service.exe” (running as SYSTEM) will have loaded “lol.dll” out of “C:\ProgramData\Razer\Synapse3\Service\bin”, causing the “RegisterServices()” method in the implemented IPackage interface to execute cmd.exe. When the service loads “lol.dll”, it sees it as valid due to the cloned certificate, and EoP occurs due to the “malicious” logic in the IPackage implementation. Razer fixed this by implementing a new namespace called “Security.WinTrust”, which contains functionality for integrity checking. The service will now call “WinTrust.VerifyEmbeddedSignature() right after pulling all the “*.dll” files from the Razer directory. When looking at “WinTrust.VerifyEmbeddedSignature()”, the function utilizes “WinTrust.WinVerifyTrust()” to validate that the file being checked has a valid signature (through WinVerifyTrust()). If the file has a valid signature AND the signer is by Razer, then the service will continue the original code path of checking for a valid IPackage interface before loading the assembly. By validating the integrity of the file, an attacker can no longer clone the certificate off of a signed Razer file as the signature of the newly cloned file will not be valid. For additional reading on trust validation, I encourage you to read the whitepaper “Subverting Trust in Windows” by Matt Graeber. *Note: While the disclosure timeline was lengthy, I have to assume it was due to a disconnect between the folks at Razer managing the H1 program and the folks at Razer working on the fix. Once I was provided an internal contact, the timeline and experience improved drastically.